Sculptor: Gordon Kray, Washington, D.C. 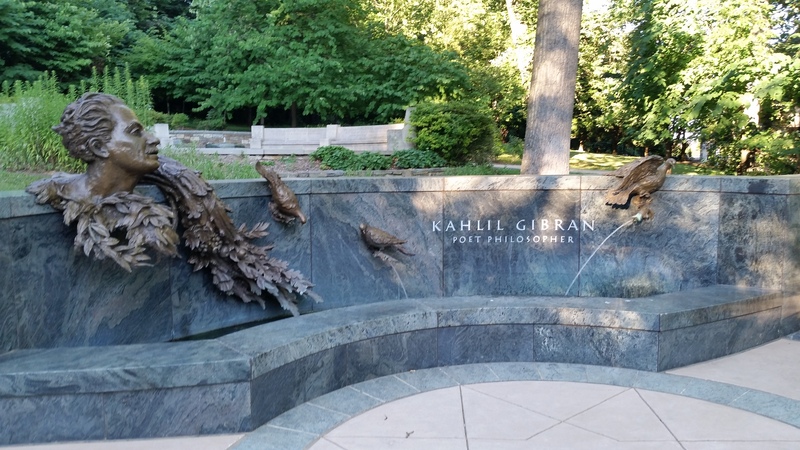 The Memorial to the Lebanese poet Kahlil Gibran is a peaceful, recessed 2-acres on Massachusetts Avenue across from the British Embassy. To get there one has to cross a foot-bridge that leads to the memorial entrance – a bust of the poet, a water feature and a dove. The dedication, led by President George H.W. Bush, and included the Marine Corps marching band. 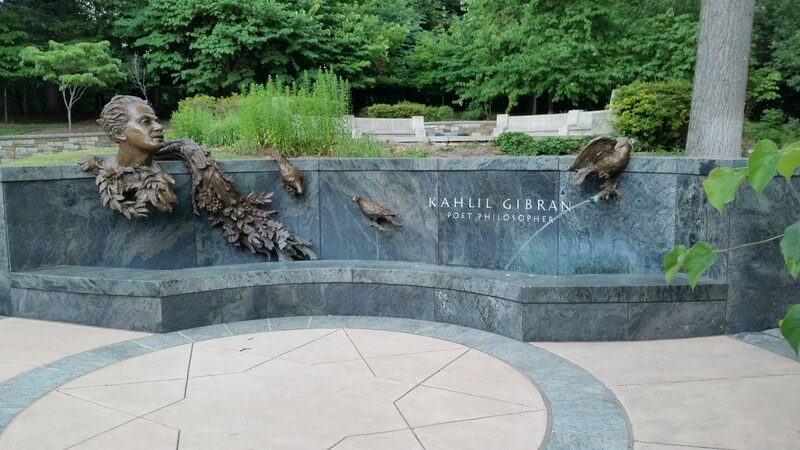 The memorial to the poet who wrote “The Prophet” in 1923 was conceived of by Sheryl Dekour Ameen and is the first monument to an Arab-American on federal land in Washington. Congress approved of the memorial in 1984, and the National Park Service gave a vacant parcel of land on Massachusetts Avenue. Lebanese American conservative William J. Barrody, Jr. led the fundraising for the $1 million to build the park. Kahlil Gibran’s Garden of Verses: President Bush and the People’s Kinder, Gentler Poet Henry Allen. The Washington Post. 25 May 1991: D1. Gibran’s Garden: Ross, Nancy. The Washington Post. 23 May 1991: T05. D.C. Garden Marks Words Of Peace Lebanese Americans To Memorialize Writer, Barbour, John. The Washington Post; Aug 12, 1989; B6. The Eternal Kahlil Gibran: Never Has One Prophet Done So Little to Deserve So Much. By Jonathan Yardley. The Washington Post; 08 Oct 1984: D1.